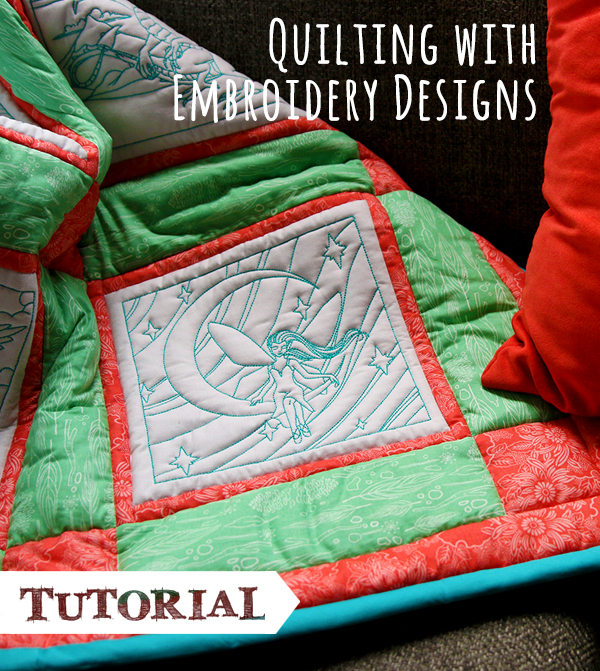 This tutorial will show you how to embroider through the quilt top, high-loft batting, and stabilizer to create a fun and puffy look on your quilt. 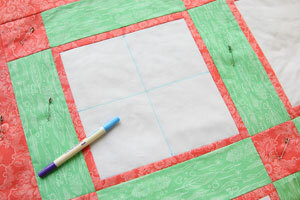 Special notes: This tutorial assumes that you a) already have some familiarity with quilting in general or b) like me, you are cool with rolling through and learning new projects as you go, so we will not be covering how to create the quilt top itself. 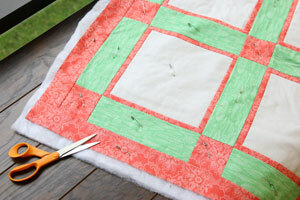 For beginners to quilting, check out this tutorial for the basics you need to know! 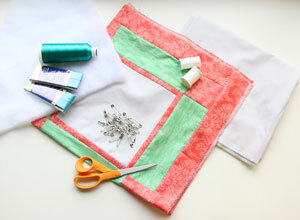 Grab your fabric, tools, and sewing machine, and create your quilt top. 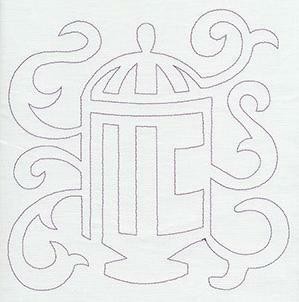 Make sure to make some nice squares to showcase your embroidery designs in between all your fun fabrics. 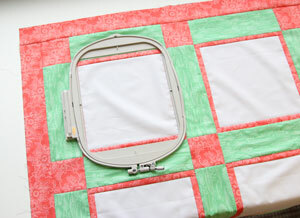 It's important to make sure you have enough fabric around the embroidery area to hoop your quilt top. 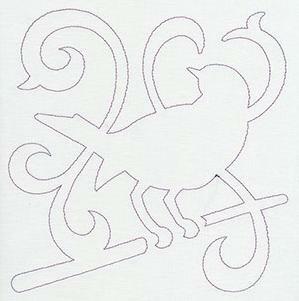 Make sure you've got plenty of room, so you can place your embroidery wherever you want! If your high-loft batting isn't fresh out of the bag, it has probably expanded and is full of air! 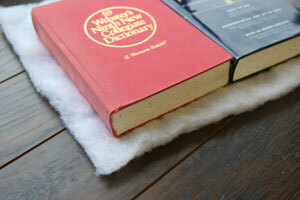 For the best embroidery results, press the batting under some heavy books or a big flat board to re-compress it. 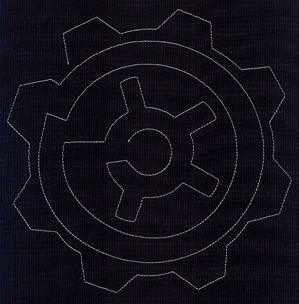 Leave it to sit for 30 minutes and you'll be all set to go! 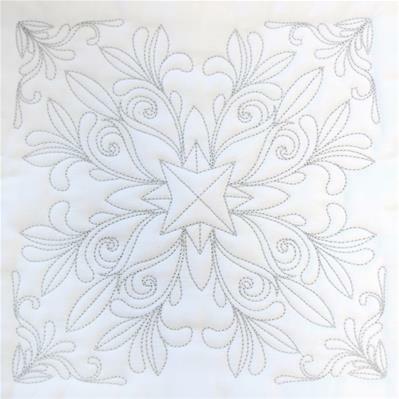 For another option, you can purchase washable batting, that expands after the first wash.
Now that your batting is all set to go, cut out a big piece that is larger than your quilt top. 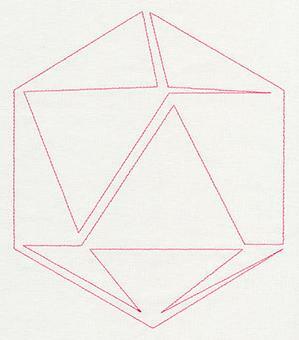 Make sure there is some extra batting around the edges on all four sides. 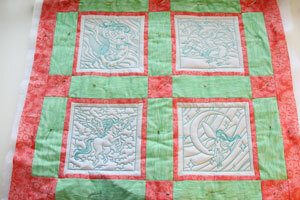 Then spray the batting with temporary adhesive, and smooth the quilt top on top of the batting. 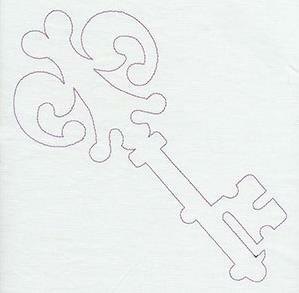 Grab some curved safety pins, and pin those two layers together. 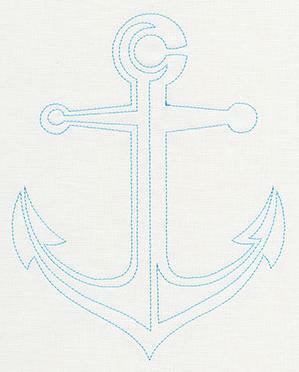 Between the adhesive and the pins, this fabric isn't going anywhere while we embroider! 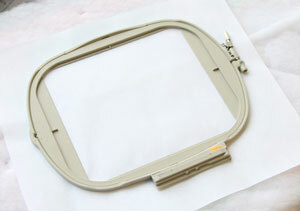 Next, cut out a piece of cutaway stabilizer bigger than your hoop. 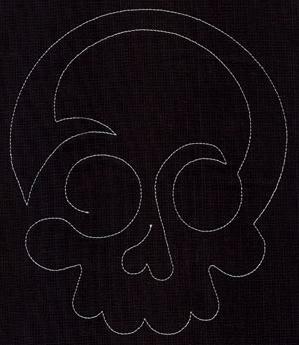 Spray on some temporary adhesive, and smooth the stabilizer on the backside of the batting behind where the embroidery where stitch. Make sure it's in the right place, and leave some wiggle room in case you need to move that hoop around. 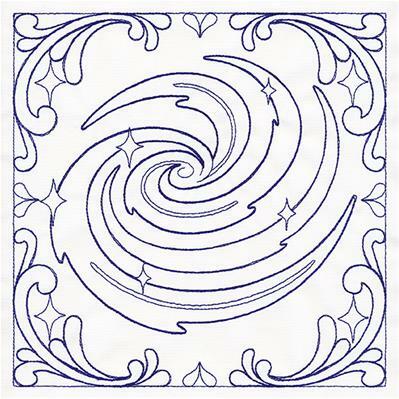 On the quilt top, use an air-erase pen and a ruler to find the center of the square, and draw some crosshairs to help with hooping. 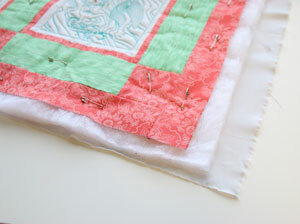 Move any pins that are in the way, and hoop the quilt top, batting, and stabilizer together. 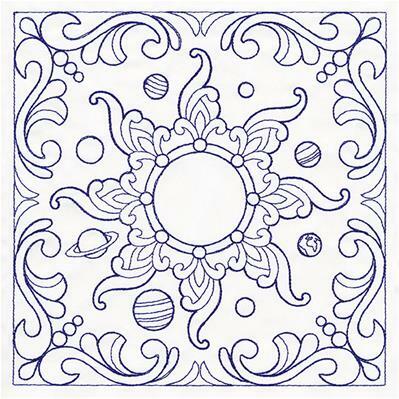 Make sure it's tight, and line up the marks on the hoop with the lines you drew earlier! 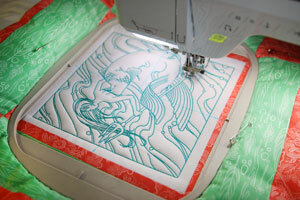 Load your design on the machine and embroider. 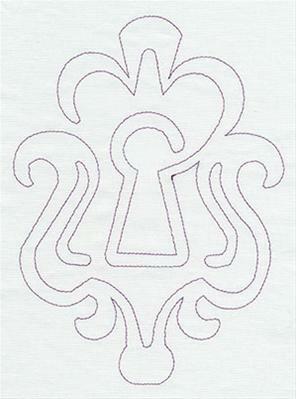 After the embroidery is done stitching, use a scissor to trim away the extra stabilizer on the backside of the design. 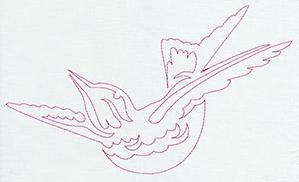 Now that you have finished one design, repeat the steps to add embroidery all over that quilt! 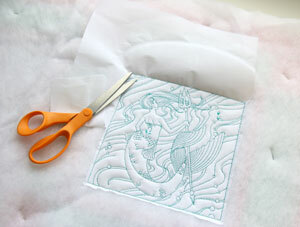 Make sure to add stabilizer behind each of the designs before sewing. 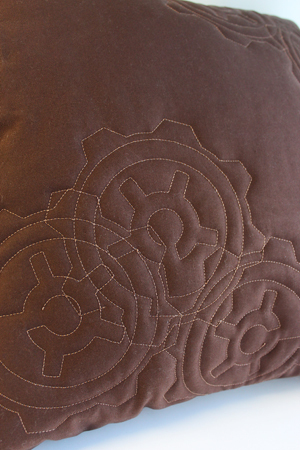 Once all the embroidery is done, cut a piece of baking fabric just a little bit bigger than the batting, and pin all those layers together! 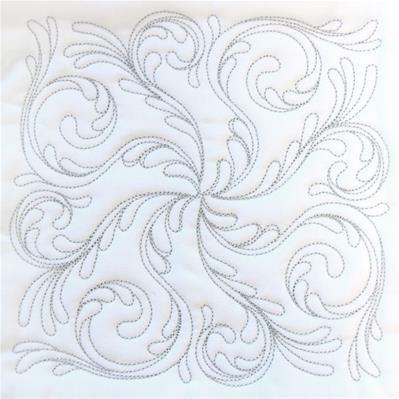 Curved safety pins work great for quilts, because their shape allows you to catch and hold all that fabric without shifting anything around. 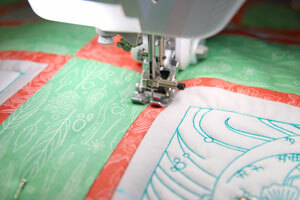 Then go back to that good old sewing machine, and sew any other fun quilting detail that you want. 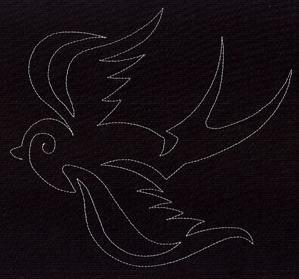 I used clear nylon monofilament thread and a bobbin wound with thread matching my backing fabric to "stitch in the ditch". 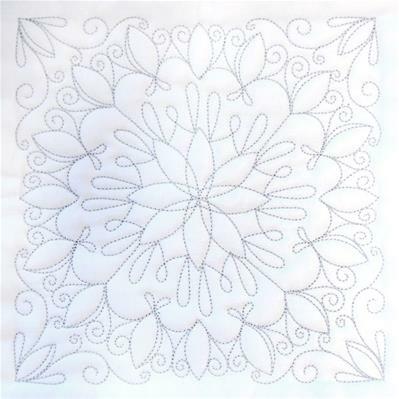 This means just sewing in the seam between all my quilting squares to bind the layers together and enhance that fun puffy effect from the high loft batting! 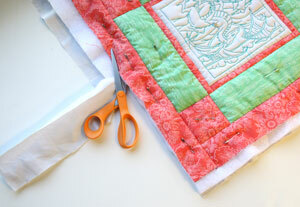 When the quilting is all finished, use a scissor to trim away all that extra batting and fabric from around the quilt top. 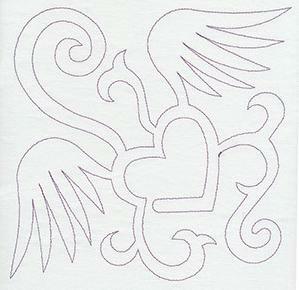 Add some binding, and you are all done! 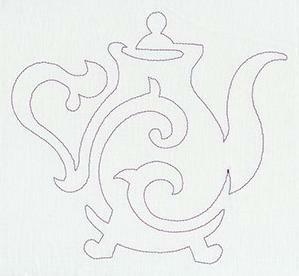 Simple patchwork designs combined with unique embroidered designs can make a quilted wall hanging like no other. 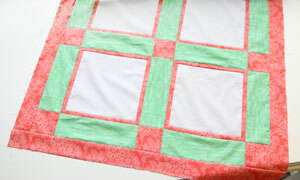 Keep it small, or take it to the next step and use these techniques to create a full sized puffy quilt to decorate your bed or couch! 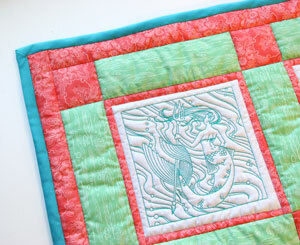 Don't feel like going the traditional route with your quilting? 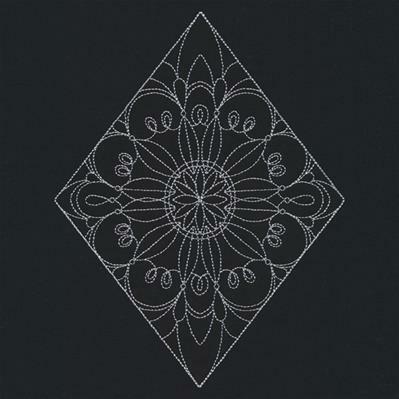 These light-stitching designs are fun for all kinds of effects. 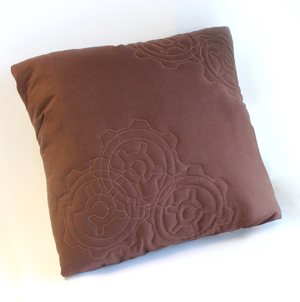 Stitch your quilting design over fabric layered with batting to make a perfectly dimensional pillow. 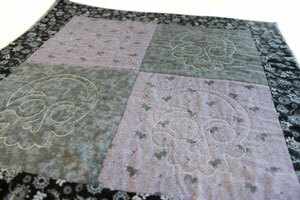 Try overlapping a few quilting designs to bring a new dimension to this textured look. 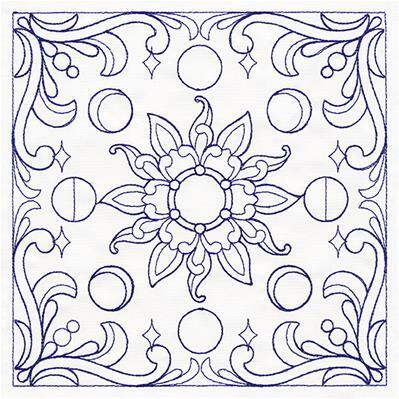 Quilting designs can be scattered throughout a project, or used selectively to create a subtle decorative effect. 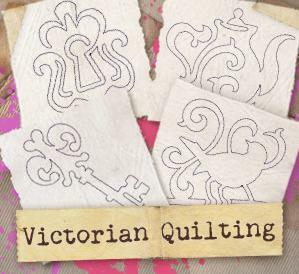 Try them out on all kinds of projects, and enjoy experimenting with your new quilting designs.